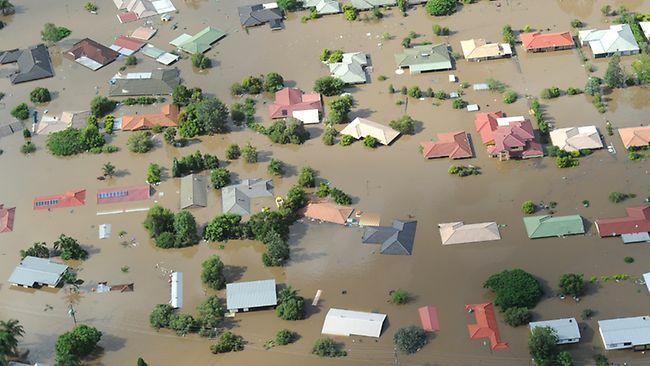 BRISBANE is besieged by the flood of the century, with more than 30,000 properties to be inundated tomorrow… The Queensland capital is now the scene of a natural disaster unprecedented in contemporary Australia. The Brisbane River is due to reach 5.2m on a 4am high tide, 30cm down on the predicted peak, but approaching the mark set in the devastating 1974 floods that claimed 14 lives. Earlier this year in Australia, the Bureau of Meteorology released a Special Climate Statement on the recent exceptional rain and flooding events in central Australia and Queensland. February 28th 2010 was the wettest day on record for the Northern Territory, and March 2nd set a new record for Queensland. Over the 10-day period ending March 3rd, an estimated 403 cubic kilometres (403,000 gigalitres) of rainfall fell across the NT and QLD. Extreme, indeed. It was the wettest December on record for Queensland and for eastern Australia as a whole, the second-wettest for the Murray-Darling Basin, the sixth-wettest for Victoria and the eighth-wettest for New South Wales. For Australia as a whole it was the third-wettest December on record. This followed an extremely wet spring, the wettest on record for Queensland, New South Wales, eastern Australia and the Murray-Darling Basin. The heavy late November and December rainfall followed a very wet July to October for Australia, meaning many catchments were already wet before the flooding rain. It was Australia’s wettest July to October on record and also the wettest July to December on record. …there was no direct link between global warming and the tragic flash flooding in Toowoomba which has killed at least nine people in southeast Queensland. But he told The Australian Online that climate change would lead to heavier, more frequent rain. “As the climate warms, there is more water vapour in the atmosphere,” he told The Australian Online. “This means that there is a probability that there will more intense rainfall events around the world. My point is this. The recent “Big Dry” was almost certainly the most economically damaging climate event ever to strike Australia — certainly for rural areas. Now, on the back of this extended event, which impacted many sectors of Australian business, comes the latest diluvian disaster. Aside from the direct costs of replacing damaged and destroyed goods and rebuilding infrastructure (the insurance estimate I saw on the news today was >$5 billion), there are reports that the cascading effects could wipe 1% off Australia’s GDP — around $13 billion — mainly through export losses. These are major climate-related costs to the economy, as well as to the welfare of the people caught up in this event and the natural systems that are being damaged. Then, in Europe and the US, we’ve seen record snowstorms and extremely disruptive cold snaps, which can be linked to extremely unusual events in the Arctic, as described here. And, of course, in 2009 we witnessed the horrific bushfires in Victoria – the worst on record. Again, I repeat, these types of events have happened before, and are difficult to attribute individually to climate change versus random chance — but that doesn’t change the fact they they really hurt, economically and socially. Climate change, left unabated, will increase the frequency and severity of natural disasters. More and more energy is being trapped within the Earth system (see figure to the right), and it has to be expressed somewhere, sometime. The laws of physical science dictate nothing less. And it will, in turn, hit the Australian and World economy hard. Those economic rationalists among us should heed the reminder that these latest natural events have delivered. Avoided global heating is avoided cost (with the worst-case scenarios being incalculable). For the general populace’s opinion on climate change, what will the latest events do? I can’t be sure of course, but I suspect that it will, in many, awaken within them a deep-seated horror — “...this could happen to me“. This personal demon, fed by the graphic reporting we now get on such events, might well do more than anything else to catalyst a community consensus for real, effective and urgent action to eliminate fossil fuels. Didn’t the extended Australian drought correspond with exceptionally wet weather along the Pacific coast of South America? Will the heavy rainfall in Australia become more frequent in the future? I see that the rainfall is a result of a warmer ocean surrounding AU. Is this correct? Is it possible that normally dry Australia will become green and wet Australia with more warming of the oceans? I forgot to click the subscribe button. I do hope all of this will act as a catalyst for action. It’s amazing how quickly people forget about these things though – I just hope it doesn’t take too many more disasters to get the majority to truly wake up once and for all. I saw David Karoly, Professor of Meteorology at the Univ. of Melbourne interviewed on ABC News 24 earlier today. He was suggesting that in a warming climate, while the wet phase of ENSO will likely become more intense, the length of the dry phase may increase. I would guess that there is considerable uncertainty and it would be interesting to hear more expert opinion. “awaken within them a deep-seated horror – this could happen to me”. That may occur with a few of the more conscious citizens. Once the immediate danger has passed and things get back to something near normal the majority soon forget and just get on with doing the very things which exacerbated the problems in ths first place. A good example is here in SE QLD.This current flood is about the magnitude of the one in 1974. At that time there was already a lot of development on the flood plains of the various rivers and creeks in the Brisbane River catchment.The previous major floods had been in the 1890s. Undoing this development is very difficult given the psychology of prior investment.However,one would have thought that the local and state governments would have clamped down on further development in areas at clear risk of flooding again. Not so,greed and stupidity again held the day and now we have more damage than in 74.The thing is,you don’t need a degree in surveying or hydrology to look at the terrain and figure out what is a watercourse and what the likelihood is of this or that gully,creek or river turning into a torrent. Barry,this is just one of the reasons why I doubt whether natural disasters will change the way of thinking,let alone the mode of action,of the majority. Some of them may get religion but they will not use whatever reasoning powers they have to associate cause and effect. This is generally understood as a Yes, and it’s certainly worth trying to get this message out at this time, though I agree most folk have an almost fatalistic attitude to disasters. 2. So each event has p=0.66 of being one of the 2. I wonder if the PM has made the climate change connection or if she and the Qld premier have discussed nuclear. If a strong El Nino returns 2012-2014 as I believe Hansen predicts surely the penny will drop in most people’s minds. High food and fuel prices can also be expected in the next couple of years. Heaven forbid we put down the floods and firestorms to simple bad luck. Let’s assert the moral to this story in the positive form: “these disasters are part of a trend, a trend caused by fossil emissions”. Expressed in a positive form, we are writing the message on the wall. The brevity allows us to be emphatic — and stare down the denialists as we say it. If instead, we echo the meteorologists’ painstaking distinction between weather and climate (“… not directly caused by…”), we allow denialists to pounce on the equivocation and claim that the climate science is confused or uncertain. Absolutely agree with the hypothesis on ocean surface temperature rises and its relationship to the widespread floods. Big thanks for the very timely and informative post Barry. Lets hope the emergency relief moneys aren’t simply spent on replacing flooded vehicles with 4×4 guzzlers and fitting the houses with air conditioners. One of the shocking observations looking at the roofs poking out of the flood water in Brisbane is the fact that none of them seem to have solar hot water systems – surely one of the most effective ways to save energy in a hot climate. The climate has been warming for more than 150 years. As average temperatures rise, more water vapor enters the atmosphere and what goes up eventually comes down in Pakistan, Queensland or wherever. Like it or not, a warmer planet is a wetter planet. The media (and denialists) like to say that this flood is not as severe, and the water levels not as high as the 1974 floods. They don’t seem to pause and consider that, if the Wivenhoe dam hadn’t been built to protect Brisbane, the volume of water flooding Brisbane would have been so much greater and the speed of flooding immeasureably faster. Fortunately the dam authority was able to release water in a controlled manner but the dam is still full. According to the BOM a much greater volume of rain has fallen in this event than in 1974. The cyclone season is far from over and this La Nina is predicted to last much longer than normal. Is it sensible, in this situation, to re-build in areas that were known to be at risk of flooding, even before this disaster? Thankyou Barry for speaking out on this dire problem – let us hope politicians wake up and act to curb further CO2 emissions before things get even worse. Interesting comment,Ms Perps.I have lived in the Brisbane Valley not far from Wivenhoe Dam wall for the past 15 years.I worked in emergency services in the area for 10 of those years so I know the area fairly well. I was not here in 74 so I don’t know personally what went on then.This time there was a long build up to this flood with well above average rainfall in October and December so by the time the heavens opened in January the ground was saturated and all rain that fell ran off.The flood reserve in Wivenhoe had been emptied several times prior to January. Lockyer Creek,with its tributaries Buaraba and Laidley Creeks, had been in minor flood for weeks in the latter part of 2010.The catastrophic rain event in the headwaters of Lockyer Ck on the Divide and in Toowoomba on Monday plus subsequent heavy rain sent a huge amount of water down Lockyer Ck into the Brisbane River below Wivenhoe Dam. At that time the flood reserves of both Wivenhoe and Somerset Dams were near capacity and releases were scaled up to safeguard the dams. It was fortunate that the the rain ceased over the whole catchment on Wednesday otherwise there would have been a truly memorable flood in Brisbane. The point of all this history is that a lot of people,particularly in Brisbane,put a lot of faith in the efficacy of Wivenhoe Dam to prevent disaster downstream.The truth is that Wivenhoe and Somerset can mitigate medium scale floods but will not prevent or mitigate major floods. The only way to prevent damage from major floods in the Brisbane catchment is a managed retreat from the flood plain. Given the lack of ordinary nous and courage in the leadership I don’t see that happening.And,as you say,it is still early days in this summer rain season,with a La Nina scenario,6 cyclones predicted and we have had only one. Good luck to all those on the flood plain. Wivenhoe demonstrates, I believe, that mitigation of floods and droughts by the building of dams may be a more realistically priced option than many climate change avoidance schemes. Adaptation has to be a part of any serious strategy. 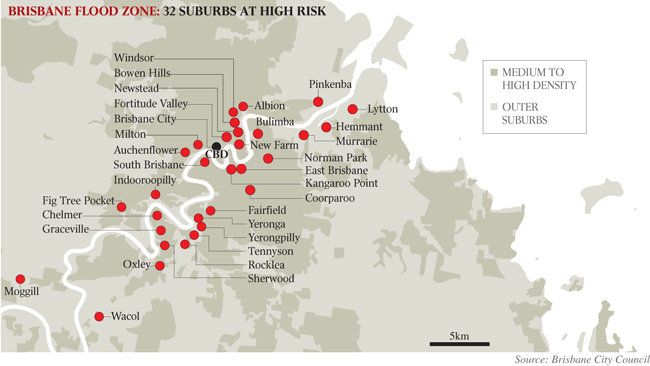 In terms of this flood costing more than 1974, surely the fact that Brisbane is a richer economy than in 1974, with more assets available for destruction, is a big part of the equation. What a load of old shoes! When we had bigger floods in the 19th century than the 20th c and bigger floods in the 20th c than the 21st c, how does that logic work? One of the most alarming sights on the TV is all the new homes being inundated in a small flood. While my sympathy for those affected remains acute, there are certainly some embarassing questions in store for the regulators of building standards and of land use in Queensland post 1974. It is clear that those who are searching for signs of climate collapse have to be very careful about phrasing their debate. Yes, I agree with the basic thrust of the greenhouse/ACW debate, even to agreeing that ACW is today’s greatest global challenge. However, I would never try to justify that conviction by reference to the hydrographic record of one or two rivers, no matter how great an individual flood may be. Individual floods are simply irrelevant from the statistical point of view. I would counsel against even suggesting that this flood might be some sort of sign of worse things to come. It is close to “business as usual” and a reminder that those who choose to live on low lying land, beside a river or with an ocean frontage need to take a very long term view when deciding the security of their home. Actually it could be seen as irrelevant whether any one event is “caused” by climate change. (You can always be certain, in any case, that it was affected by climate change). More importantly, this kind of event is the sort of thing that will be more frequent as climate change progresses. Do you want more of these kinds of events, or fewer? In other words, the floods show how much damage and cost is caused by extreme events, be they natural or human-induced. Anthropogenic climate change will increase the frequency of extreme events, and this will cost us dearly if it is not addressed. The evidence of the force of nature is expressed in these events, irrespective of relative attribution. (you also seem very sure of your position, I wonder what gives you such surety). In addition, the bigger floods of the past were, in part, due to less flood control than today. Wivenhoe Dam, for instance, did not exist in the 19th C or much of the 20th C. That made a big difference. Yes, Wivenhoe with its 230% capacity was effective in some mitigation and it is a pity that the Lockyer and Bremer where most of the deaths occurred didn’t have dams with reserve spillways that afford this protection plus their other advantages. However it is clear that in the more recent [ACO2e affected] years, big floods [like cyclones] are becoming less frequent. 2) oil fails to increase in price even as it runs out so we won’t have alternatives ready in time. We seem to want to live in hazard prone areas. If we relocated to Sturt’s Stony Desert there would be little risk of fire, flood, mudslides, dengue fever or coastal erosion. Floods and droughts have always occurred in Australia and always will.It is likely that anthropogenic climate change will alter the frequency and severity of weather events. Simplistic solutions conceived in the arrogance of ignorance serve no purpose except to obfuscate the real issues.For example,building more dams will do nothing to mitigate droughts or floods.Dams make the situation worse in most instances. There are many actions which need to be taken to safeguard Australia in the very challenging times ahead.May I suggest that the very first thing to do is to abandon the anthropocentic atitudes which have caused so much damage to this beautiful and unique land. Mother (Nature) could not care less about the naked apes.Mother will do her own thing regardless.Either the apes learn to work with Mother or they perish. I can’t believe anyone said that. Wivenhoe is and has been doing exactly the reverse of what you just said. Just consider the Gold Coast without the Hinze Dam. Currently it provides a catchment where farming can still be carried on close to a big city because it cannot be subdivided. It provides great wildlife habitat close to same big city. It provides a great recreation area close to same big city. And at the same time it provides WATER. You may not use it but most people find it essential. Now consider if it was not there and we just used the Tugun desal plant for our water supply. Water would be hugely more expensive. You would likely have in its place a sea of roofs stretching to the border. And there would be no wildlife habitat or recreation area. IOW, it is a win/win/win/win. Plus that same sea of roofs would cause huge flood amplification, not mitigation and a beautiful valley would be lost to farming. I’m not about to claim that the Wivenhoe mitigation system was managed to the best of its ability but then you would need to be lucky to get it absolutely right. And as gallopingcamel said upthread, a warmer planet is a wetter planet. That tends to mean that we are likely to see an increase in larger magnitude floods. Global ACE is near 33 year lows. Also in eastern Australia no cyclone has crossed the coast south of the Tropic of Capricorn since 1976. IOW the southern half of Qld and NNSW have been virtually cyclone free for 35 years when previous to that we had up to 6 cyclones per season. We’ve never had it so good [excessive weather wise] during this period of the greatest increase in ACO2e. Could Richard Lindzen’s theory be right? Sorry David but when RC allows other PsOV they might become [more] credible. I tend to agree with your P’sOV. My point, perhaps poorly made, is that I do not see any signal at all amongst a large amount of noise when it comes to single weather events. OTOH, feeling compassion and offer (cash) support to those affected, even though I consider that contributory immediate causes include inappropriate land use and building design, perhaps negligently so. Repeating… with or without human induced climate change, those who choose to live, work or play beside major rivers or oceans must do so in full awareness that significant risks are involved. David, the Lindzen theory I am refering to is his claim that if the poles warm more than the tropics [as claimed by the models] then the world’s temperature gradient is less therefore storm energy is less. Considering we live in THE land of extreme variability we should never forget it and be thankful if extremes are moderating. Given that ENSO events can now be detected several months prior to their peak impact period, the opportunity exists to use climate variability insights to more accurately predict the chance of climate related emergencies occurring in the forthcoming season or year. Simple, Peter. Stop ignoring the externalities and the remainder of your post evaporates. Cost of coal fired generation plus external costs > cost of nuclear generation every time. How to charge for externalities? The tax system is the obvious choice, because it is the way that health etc are funded. Thus, a tax on coal is sensible, provided that it is used for the purposes for which it is raised… health, etc. Not pensions, not politicians’ pay rises, not omployment schemes, not bank bailouts, just for the externalised costs of coal. Are Australia’s floods the revenge of Gaia? frequent than they were in the 19th centrury. spangled drongo, on 14 January 2011 at 2:27 PM — The link is to my study of the effect of CO2 on temeprature; a Real Climate open thread was simply a convient place to put it. Real Climate does science; the non-science junk now goes to the Bore Hole there, so all (temperate) PoVs are now represented. Lindzen’s point about a lessened temperature gradient is an obvious one. The effect on storm frequency and intensity is something which could be studied; somebody probably is. However, since the water content is going up, precipitation events (whenever such occur) will be more intense. So the general prediction is for more droughts, punctuated by more extreme precipitqation events. Yes, that’s what they predict David, and you would think that the logical conclusion from that would be more dams which would improve both of those predicted situations. But instead they build desal plants! Building large dams can change the hydrological features of an area and give some bad unintended results. It can also have serious ecological impacts. However, a well researched area which already does not have great ecological values may be a better alternative to expensive desal, and may serve as a flood prevention strategy. Personally, I’d like to see more grey water being recycled and used for agricultural purposes. Fresh water would have to be the single most wasted resource in Australia. Has anyone ever done a serious ecological comparison of a large dam like say Wivenhoe before, and 30 years after, construction? And then compared it to what else may have been built on the site if the dam hadn’t? Fully recycling grey water would be probably as expensive as 100% desal. And surely after expending all that money and resources you would feel a dill standing in the rain, drinking your own urine. What chance has Peter Lang got of getting support for reducing basic costs on NP? people just replaced the machine. Economically, given the cheap price of water and the expensive price of fixing washing machines, this was just bloody stupid. Global warming is here to stay for a long time and the consequential climate changes will have severe impacts in many parts of the world. We live in an interglacial period where warming typically has a steep curve, with occational spikes of cooling, followed by a more gradual cooling toward a new glacial period. Prevention is not a keyword in this scenario,-but accomodation is. Move away from flood prone areas and be prepared for changes in the climate that will impact agriculture in many parts of the world. What does that graph look like if you extend it to the present time? turbut, on 16 January 2011 at 2:07 AM — The next possible transition into a glacial is not for another 50,000 years; not all interglacials are created equal. The last best chance of such a transition was about 1000 years ago or even as late as LIA. In any case, the forcing for that was so weak that nobody cdan be certain whether it would have occurred without the excess CO2 + methane due to human activities. Are you Sirius? It’s that little horizontal red bit hard right. The extent to which human activity should take the total blame for global warming must be considered within the framework of activities that are indirectly responsible for a rise in CO2 and Methane levels. Human activity such as clearing of jungles has indirectly contributed to the increase given the amount of CO2 they absorb and aiding in the release of additional amounts. Rising temperatures will exponentially increase the amount of methane and CO2 released into the atmosphere, causing further warming. Volcanic activity adds immense amounts of CO2 to the atmosphere. A single, major eruption can add more CO2 to the atmosphere than all human activity since they left Africa some 70,000 years ago. Cattle produce about 600 litres of methane per day. The total number of cattle in the world is estimated to be 1.3 billion, thus a total of some 780 billion litres per day. Cattle ranching is now to a large extent the main activity taking place in areas where the jungle has been cleared, especially in South America. Increasing release of methane from the thawing tundra in Siberia Northern Canada and Alaska will immensely add to the total warming effect of these heat trapping gasses, especially considering that methane is 20 times more potent than CO2. 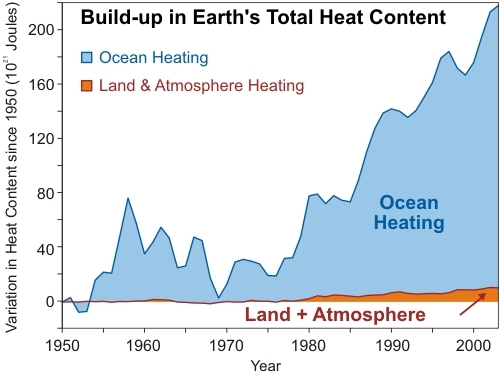 It stays in the atmosphere only about ten years but the built up surpasses the natural reduction and methane has been on the rise since 1750 and at a much faster rate since 1950. The increase in the rate of methane release since 1950 correlates nicely with the increasing world population and the agricultural/industrial activity needed to support it. Methane increasingly being released from the tundra will add considerable to it. my Grandchildren” p.36-7). There is no reason to think we are doomed to follow the curve in the graph on spangled’s link . Just like our current weather and climate. We know what a great handle science has on the effect of ACFCs. After eradicating them the ozone hole is unchanged. turbut, on 16 January 2011 at 11:06 AM — Krakatau was fairly big. See if you find find even a bump in the Law Dome CO2 data. Tambora led to the year without a summer. Try that one. Tambora ejected some 50 cubic kilometers of magma which circled the earth and severely reduced the amount of sunlight reaching the earth. The length of an eruption is more significant with respect to producing CO2 in large quantities than the shorter period, highly explosive eruptions. Krakatoa was a major-major explosive event that caused crop failures in Europe due to a drop in the temperature–the same effect that Tambora had in 1815. Both eruptions left their footprints in the ice cores. There are no reliable estimates of the total amount of CO2 that volcanoes produce in a given year, not withstanding that it clearly depends on the amount of volcanic activity. Bob Brown says coal industry should be held responsible for flood. He does say some things that are a bit silly sometimes. Seeing as almost everybody else has rolled over, dumb, before the storm of ain’t-it-awful sentiment, the Senator is showing remarkable political courage. He then spoke of taxation. Prof David Karoly, on the 7:30 report 12 January, did have the courage to say that we must expect ongoing La Nina events, with worsening floods in Queensland and worsening bushfires in Victoria. He could easily have said, “I told you so”. But not even Bob Brown would go so far as to say that “Australia is addicted to gas”. things aren’t expecting ozone levels in the stratosphere to return to levels seen in the 1950s until about 2080 … so your sarcasm is at least a few decades premature. What if the ACO2e theory turns out to be similar? Please provide (non-subscription) links. The two links you provided do not support what you have said. If you really are subscribed to those periodicals and they contain text supporting your assertions, please copy and post the text itself. But the take-home message from all this is the level of scientific understanding of these atmospheric problems is very low yet true believers like Trenberth want the null hypothesis reversed. But I did find it elsewhere on the web. I’ll look. Whew, what a relief. It is quite the reverse of what I thought you said. Spangled, your opinion differs diametrically from that of the researcher you quote. Yes, there may be reason to revisit the details of the actual chemical reactions involved in the stratosphere. Your contributions re ozone are not only off topic, they are also a beat-up. What Bob Brown could have said is that if CO2 is the main driver of recent climate change then Australia spectacularly fails to lead by example. Some might say we have outsourced a lot of our pollution to China but their huge population dilutes the average emissions. I expect that once the flooded Qld coal mines get back on their feet then coal prices will be excellent. More jobs, more exports … all good according to the economists. However Australia’s coal exports of 260 Mt to all countries are paltry compared to China’s annual coal consumption of 3,200 Mt. When they can’t get enough coal, oil or gas things might look a bit different however. So you’re not at all sceptical about the level of scientific understanding here? You deny there’s a problem? with reasonable certainty that the results were due to sample contamination. Perhaps a chemist reading BNC could give a full explanation, but there doesn’t appear to be any gaping chinks in the understanding of ozone in the stratosphere. And of course, SD’s original sarcastic remark was an attempt to argue that chinks in that theory should also demolish confidence that atmospheric chemists and physicists understand the radiative forcing of CFCs. Pope results weren’t any more wrong than Lin’s. Neither of them understand the impurities. As I said the LOSU on this and ACO2 warming is poorly understood with the s/n barely distinguishable. You indicated that the graph shows the present time. However take another look at it and the graph actually ends around the time of 1900. Why has the graph not been updated? Or maybe it has and is posted elsewhere??? I think the scale along the bottom is not too exact but I’m sure we both recognise that 21st century icon, the blade of the hockey stick! well tested theory with one anomalous and unreplicated dataset. I would like comments on this report. To me it appears to align with my observations. But I can learn from your positive and negative opinions. water is sensible (or not) on a case by case basis”. I’d also say this is a sensible statement in relation to both dams and desalination too. I’m not suggesting we should try to recycle/reuse every last bit of urban water, but where it is practical. Also, recycled grey water and storm water doesn’t need to be drinking quality for agricultural and industrial applications. @Gene Preston asks for “positive and negative opinions” on his reading material. For a start, it helps your readers if you youself would assert something clearly, which we can agree with or tear to shreds. The link is only proof that what you have said is sincere, rather than a study effort for your trusting readers. Doublecheck anything that you read on “sciencedaily”, as it passes on some very dodgy press releases. In this press release, you can detect the use of the word “Fahrenheit” which is one immediate signature of a pokerfaced spin doctor wheadling the ignorant. The author is passed off as a climate scientist. But then you see that his field of study is the distant geologic past, where the evidence is spread over millions of years, whereas our collision with the climate is occurring over mere decades. He goes on with minced words, as though funded by an oil company: “If we don’t start seriously working toward a reduction of carbon emissions, we are putting our planet on a trajectory that the human species has never experienced” This is a ghastly understatement, the sort of intellectual cowardice you’d expect of the speechwriters to Prime Minister Gillard. In fact, on the same page is a link to an article that says we must get to zero emissions asap if the climate is to recover within 500 years. If you want to see hard figures on the acceleration, I recommend the graphs of measurements by NOAA, where we see the relentlessly rising CO2 levels. The second graph, over 50 years, shows how it curves concave upwards, which implies that the rate of climatic disasters is accelerating. I have called it a collision. A geologist might call it an extinction. I think the use of Fahrenheit in the science news was solely because that paper went to US audiences. Can you believe we still do not use C here in the US? Its unlikely the author of the study is being paid by oil companies because he said that climate models were underpredicting by a factor of two compared to the geological record. I beleive he is correct i that the current climate models are underpredicting. I don’t think the science news nor the author have anything but an honest assessment of what they believe are the facts. The statement “If we don’t start seriously working toward a reduction of carbon emissions ….” is consistent with Hansen and others and my own opinion. If you look at that NASA CO2 curve trend its even accelerating itself. I think the dire warning is consistent with the evidence. By the way that ice melting trend was a NASA project also, the GRACE satellite data. I appreciate your comments, thanks. Others? I’m a geologist and in time, extinction, at least in large parts of the world, may be the correct expression. Even though the flood in Australia is (was) caused by La Nina, the results of it serves as an example of what can happen when serious global warming takes effect. The cost is not only the loss of human life and economic losses. The crop losses results in reduced availability of foodstuff, in turn resulting in increased worldwide prices. It does not take a great deal of imagination to visualize what similar events occurring at the same time in major crop producing nations would do to the world’s food supply. We can argue or discuss the huge, and often contradictory amount of scientific evidence that points toward global warming but the consensus remains that large-scale changes in the climate will occur. There is no evidence that human intervention will make any difference, thus preparing for the inevitability is perhaps the only logic choice. Come on Gene, pull the other one! Am or erican science went metric in the days of slide rules and log tables. Admittedly, a lot of old American scientists still teach in CGS, so their students have to study in CGS and publish in SI, but both systems use Celsius. Intelligent laymen anywhere understand Celsius, only if a purportedly scientific speaker thinks you’re stupid will he use Fahrenheit. If we are really stupid, we would believe him when he says that as long as we pretend to start seriously thinking about a reduction of emissions somewhere sometime, we can feel free to continue emitting as usual in the meantime. I urge scepticism when you see the weasel word “reduction”. You can test if the speaker is sincere if you can get him to replace it with “replace”. I think you’ll find that James Hansen would cheerfully use “replace”, “eliminate” and so on, even if our PM wouldn’t. Only if we are willing to replace all possible carbon emissions with nuclear will our inheritors have a snowball’s chance in hell. I must sign off… work to do. You are sceptical of sceptics yet you embrace 2 theories for which the level of scientific understanding [and evidence] is abysmally low. You need to be more even handed in your scepticism. That Monty Python parrot was “well nailed down” but I think it was dead. Readers, I regret causing the thread to be cluttered with an argument about units — I was just stirring, sorry, Gene. Instead, let me praise your use of the GRACE satellite data. The graphs you showed (@ : -day) answered a long-standing question about the ice budget, how fast (indeed whether) the ice caps are shrinking. IPCC predicted 300 years (very approx!) for Greenland’s 7 m of msl rise, so we want warning of “when”. The timeseries shows that the Greenland ice cap at least, is melting faster than it is accumulating. Moreover, the melting is accelerating. In the 1990’s msl rose at only 3.2 mm/a, though already significant to someone planning a coastal plain building to withstand floods across100 years. That’s before accounting for the (currently smooth) acceleration. A major concern arising is, where and when will the acceleration break and become surges ? Thanks Roger. Its those accelerations of CO2 and Ice loss that worry me and the smoothness of the trends. The smoothness shows to me that the climate is engaged in a switching process which annual fluctuations are having little effect. If the 10% per year acceleration in ice melting continues its easy to show in a spread sheet that Greenland will be gone by the end of the century. 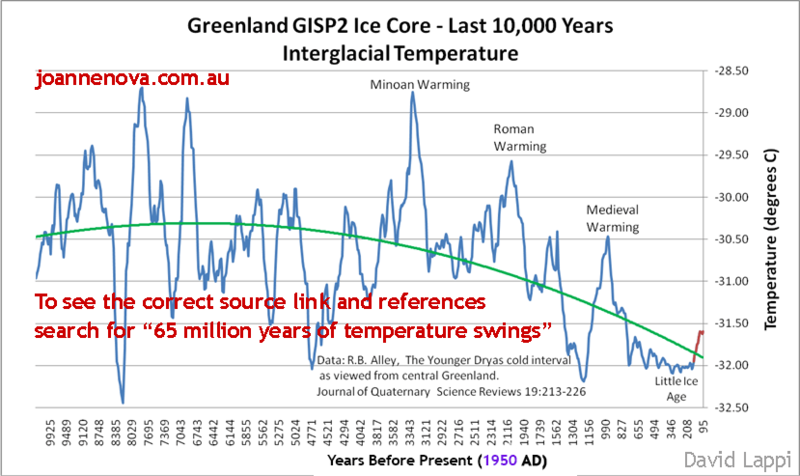 Therefore the only way Greenland will not be gone by the end of the century is for the acceleration to not only stop accelerating but to turn a corner so that the ice melting trend becomes one of decreasing. Now ask youself, what is going to make that ice melting trend reverse? What physical effect have we monitored that shows the ice melting trend will reverse? So far there is no evidence as far as I can see in the data. The cold winters here in the US and Europe simply shows us that the cold air that should have stayed in the arctic moved south and was replaced by warmer air that moved into the arctic. I.e. the Earth is powering up. Low pressure systems seem to be larger now than in the past. Have you noticed this? Those larger lows and highs move a lot more air between the arctic and lower latitudes, equalizing the planet’s temperatures. Thats the evidence I see that climate change is happening. These trends should continue to increase each year in step with the increasing CO2. There needs to be a gradual retreat from the flood plain. When they rebuild those residences which cannot be saved, it’s to be hoped that the authorities will go to at least the 1893 flood level and then build a contour [levee] bank at least two metres above that level and then ensure that ALL future housing development goes above that levee. I think everyone would then be safe provided we didn’t get one of those five hundred or is it a thousand year flood. Those who remain on the floodplain will be flooded again and probably sooner rather than later if global warming/climate change predictions are correct. I concur with your thoughts that if the ice melting on Greenland and Antartica accelerates even slightly every decade throughout this century the sea level rise will be very high by 2100. Maybe I need to post that on Barry’s other blog site. Thanks Peter Lang. Yes indeed, the suggestion is worth investigating. But my main point was to ensure that ALL future building, including those currently beyond salvation and having to be replaced , should occur well above the 1893 flood level. That was my take on it. The Peter Skinner article Peter Lang linked to sounds like a good idea. The only bit that made me wonder a little was when he wrote “a series of sturdy floodgates would need to be established at the main access points that act as drainage lines in downhill flooding. In flood response, a truckload of sandbags may be needed to seal each opening against a rising river flood“. I’m no engineer, but sandbagging sounds a little stone-age for a design that sounds so modern and innovative. But hey, whatever gets the job done I guess. Yes Tom Keen and Peter Lang. Not sure about sand bags but more high rise is the way to go Peter. That should have been happening more in other cities as well to ameliorate against very costly urban sprawl. Don’t know the geology of the Brisbane floodplain. It would be good if it was underlain by granite or something similar. Then highrise could go really high. However, there is no problem with building high rise structures on alluvium. They designers simply use the appropriate sort of foundations for the geotechnical conditions at the site. Just for interest, the rock exposed in the cliffs along th banks of the Brisbane River near the city is a tuff (for other readers, tuff is a rock fromed from explosive volcanic eruptions like Mount St Hellens). The tuff in Brisbane is an excellent material for construction (so I understand). The recently completed road tunnels under the Brisbane River were bored by large tunnel boring machines through this rock. A good friend of mine (one of those mentioned in the Acknwledgements of the Pumped hydro paper https://bravenewclimate.com/2010/04/05/pumped-hydro-system-cost/ ), came out from Canada and managed and trained the locals for the early geotechnical engineering work for the tunnels. Re Peter Skinner’s proposed high rise buildings which act as levee banks. See the article referenced by Peter Lang at 6:01pm yesterday. High rise construction relies on elevators above the 3rd level. Lifts (elevators) have lift shafts, at the bottom of which are essential pits with some control equipment in them. One common item found in lift pits is a float switch, the purpose of which is to ensure that the lift(s) are taken out of service as soon as water enters the pit(s), ie, about 2 metres below the level of the lowest floor served by the lift. As the professor of architecture knows, it is conceivable that elevators and their pits could be redesigned to tolerate flooding, but that is not currently practical and may in fact be contrary to current mandatory design standards. Elevators serving floors 3 and above would have to be configured so that they operate entirely above flood levels. Basement parking may be served by other elevators which could cut out during floods while leaving those serving higher floors serviceable, or by staircases. Access for the disabled is an architectural issue, which I will leave to the professor to mull over. Many buildings currently have security systems in place which prevent people from walking off the street and up, say, a floor or two, to access elevators serving levels 3 to 50 or whatever. Again, this is able to be overcome with new buildings, but may be quite a headache when it comes to modifying existing buildings. The third major issue is sewage disposal. Conventional sewers (ie 99.9% of all sewers) rely on open flow conditions in the sewers. Only rising mains, between pump pits, are designed to flow full. One reason for this is to ensure reliability under normal conditions, because gravity never short circuits or fails. When the sewer pipes become full they clog up, all flow stops, floating substances increase the extent of the chokes and the system further deteriorates untill all inflows cease and the sewer pipes are mechanically cleaned. Fourth, power supplies and switchrooms which are commonly located either below ground or at ground level are unable to operate when flooded. Redesign of existing buildings and power supplies serving them to ensure that the electrical system remains safe and functional is not a simple task. It is certainly beyond the skills of most electricians to design, select, install, maintain or operate electrical equipment under these conditions. Fifth and last, how the dickens do people emerge from their floodbound apartment blocks and obtain food and consumables such as medical supplies and sanitary items? Yes, I know that some will say that there will never be such floods, because the good professor’s flood gates and sandbags will hold back the flows most of the time. We must plan for those other times – when 20 sandbags and good intentions are not enough and whole suburbs of high rise developments very quickly become watery prisons. I am sure that the Dams Safety Committees of each of the States would take a very careful look at any proposal similar to the professor’s. In particular, it is not the 1:100 flood which would need to be managed, but the PMP. That means Probable Maximum Flood, the highest, meanest brute of a flood which known weather dynamics can bring to the catchments on either side of the proposed flood gates and sandbags. My initial reaction to the Category 5 Cyclone that hit north Queensland last night. It reinforces the message that we should use our wealth wisely and not waste it on poor, ideologically driven policies. Such polices will waste countries’ wealth and reduce the world’s ability to adapt to events. Cyclone Yasi is a category 5 Cyclone – the worst. But no deaths or injuries have been reported, so far. Why? Because people had sufficient warning and prepared well. Technology provided that information. 20 years ago the damage would have been worse if the same cyclone had hit the same area. The reason the damage would have been worse is that the locals would not have had such good predictions of the storms size, course and expected time of landfall. The lesson I take from this is that the better the world economy performs the faster technology will develop, not just for predicting weather events but for everything that helps improve human wellbeing everywhere on the planet. So we should not waste our wealth on poorly considered, green agendas. Economically rational policies will put us in the best position to manage the threats ahead. I’ve had a related thought about the Queensland and Victorian floods. For 30 years we’ve stopped building the sorts of infrastructure improvements and defences that we should and would have beed building if we weren’t being continually side tracked by green agendas. The blocking of dams and flood mitigation systems over the past 30 years, and blocking of fluoride in the water supplies are two examples of bad policies that Greens have forced on us.. These were ideologically driven policies by the Left. Meanwhile we wasted tens of billions of dollars on policies to mitigate climate change. For example, we forced local governments around the coast of Australia to waste their resources and funds on paying consultants to conduct studies on the effects on a 1 m sea level rise. The local governments were forced, by regulations and by scaremongering about CAGW, to waste their funds on activities they would not have undertaken if not forced to do so. What a waste!